Had my MPSS now for 8 weeks after running CONTI SPORTS and MICHELIN SPORT PILOTS. The Conti's were poor but I liked the MSP. The MPSS are the next level up in wet or dry they are a great tyre minimal road noise the spec had them a 1db louder than the MSP but I haven't noticed them any louder and they are not as loud as most of the other brands. Also I feel that the scrubbing these cars do when turning at slow speed mainly in reverse is much less noticeable with the MPSS. highly recommended all round tyres . Its time to replace my tyres. Michelin MPSS seem to be highly recommended on here. I have approached my OPC who seems a little reluctant to fit them although they too have had good feedback. The problem of course is they are not N rated and they say there could be an issue with the warranty if there is a gear box or transmission issue caused by slipping of the tyres causing unnecessary wear. They do say this is not very common but in the event the transmission fails it would be costly not to be able to have it dealt with under the warranty. They also say there could be issues with warranty renewal and if I ever take the car to another OPC. It seems a shame to have to make do with old technology (PS2s) but at the same time I don't want to void the warranty. What do others think? Is there a tyre that comes close that is N rated? Any advice would be much appreciated. The "closest" tyre would be the PS2, it's an excellent tyre despite having been around for a while. Haven't the PS2's been around for about 15 years now? Yes this is the issue the PS2 is a good tyre N rated but old technology. the MPSS is a much better tyre but not N rated so if your in a warranty you stuck with old tech but the PS2 is still the quietest better N rated tyre for the 997. Is the PS2 now discontinued? Hi. No not that I'm aware of, what makes you ask? Or are you saying your search only returned the MPSS ? Seems from another thread that the MPSS is being replaced early next year by the Michelin Pilot 4S , It is not as yet N rated but Porsche is mentioned in the release hype so maybe it will be by the launch it will be. especially if it is also to replace the Pilot S2. Yes exactly. No PS2 showed up, nor in the tyre type list, let alone an N-rated one. My experience of Michelin Pilot Supersports is only good - admittedly - I only know them on an M3. I used them from when they came out and each set has lasted about 20,000 miles. I am very picky about tyres and in fact my son ( just yesterday) took 8 perfectly good tyres (like Contisports) out of my shed to list them on ebay for me ( I'm too lazy!). I've had several M3s now and I always get the tyres changed asap to MPSSs. The Michelins give me complete confidence, they never tramline and the 20k miles includes 4 or 5 hard track days ( the car is out virtually all day as we both drive it) and I think they are incredible value for money. I haven't read through all of this thread and hadn't realised that there was an issue with Porsches?? I must say, whenever I've seen a Porsche parked somewhere, I always have a peek at the tyres to see what it's wearing, and don't remember ever seeing one with MPSS tyres. Sorry to be dense but what does N rated mean? N-rated is a sidewall code applied to a tyre which Porsche have tested and approved for their vehicles. Several car manufacturers do this - including BMW who have a 'star' as their stamp in the sidewall, and Audi who have an 'R'. The number that accompanies it is a revision number, e.g. N2. The tyre with an N is actually different from one without. 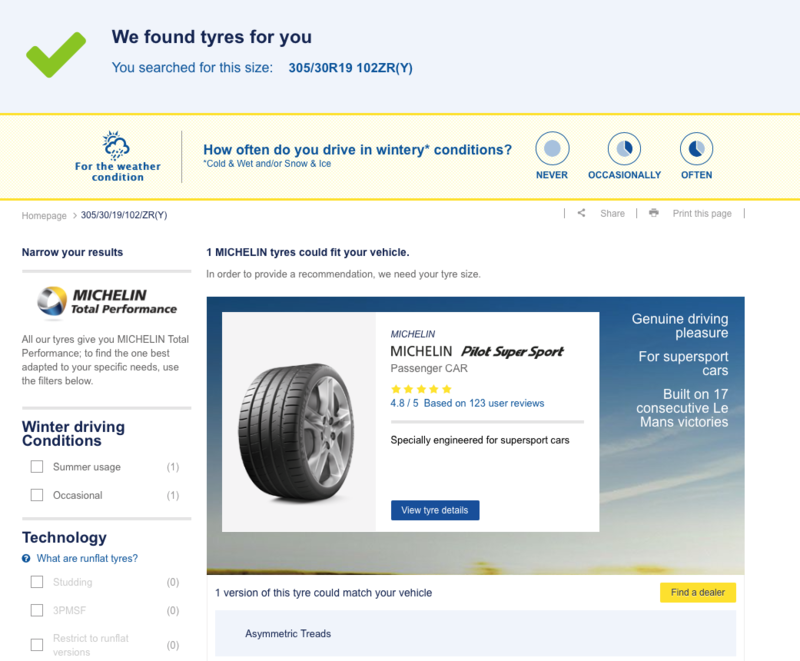 In the case of Michelin and the PS2, the tread compound is slightly different and the rear tyre sidewall slightly stiffer. Also Porsche will not provide an extended warranty if you do not fit the approved tyre. There is always a huge argument on the internet about the necessity of the N tyre - perhaps the MPSS has some advantages over the PS2 , but the most knowledgeable people seem to support that the overall driving experience is most balanced, complete and reliable with the PS2 vs. The MPSS. Any news on the PS4 being N rated?